The main opposition Maldivian Democratic Party (MDP) has decided to begin talks with the government without former President Mohamed Nasheed as a representative. The government had rejected Nasheed as the MDP’s representative on the grounds that the opposition leader is serving a 13-year jail sentence. He was transferred to house arrest this week. MDP spokesperson Imthiyaz Fahmy told the press today that the party’s national executive committee decided to proceed with the talks last night with the expectation that Nasheed will be allowed to participate at a later stage. “The decision was made after discussions with Nasheed as well. He did not want to be a barrier to discussions between the party and the government,” said Fahmy. Parliamentary group leader Ibrahim ‘Ibu’ Solih will be the sole MDP representative at talks. Fahmy said the MDP’s main demand is the withdrawal of charges against opposition politicians and supporters arrested from protests. 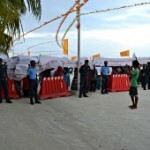 Some 400 people have been arrested since Nasheed’s arrest in February and many face criminal prosecution, he said. Fahmy said the charges against opposition protesters was a major concern for the party. The opposition MPs’ backing of a constitutional amendment to set an age limit of 30 to 65 years for the presidency and vice presidency yesterday was widely perceived to be part of a deal made in exchange for Nasheed’s transfer to house arrest for two months. 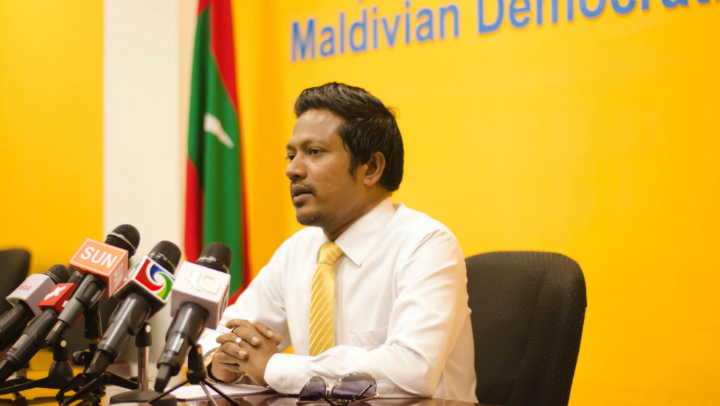 Fahmy said at today’s press conference that despite “misgivings,” the MDP parliamentary group had voted in favour of the amendment as a confidence building measure ahead of the talks with the government. “We believe compromise is a very important part in a democracy,” he said. 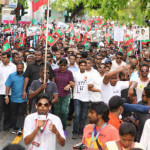 President Yameen had called for separate talks with the three allied opposition parties last month to resolve the ongoing political crisis, two weeks after a historic anti-government demonstration on May 1. The MDP had proposed Solih, Nasheed, and chairperson Ali Waheed as the party’s representatives. Waheed is currently overseas in the UK along with Jumhooree Party (JP) deputy leader Ameen Ibrahim and council member Sobah Rasheed. The JP leaders have been charged with terrorism over the May Day mass protest. The pair, along with Adhaalath Party president Sheikh Imran Abdulla, are accused of inciting violence in their speeches during the rally. Meanwhile, Nasheed’s lawyer Hassan Latheef said today that the former president believes he will able to contest in the 2018 presidential election. Latheef also said that he expected a positive development in Nasheed’s case at the UN working group on arbitrary detention in September. Nasheed’s legal team had filed a petition urging the working group to declare his detention unlawful and arbitrary. Opposition politicians are describing Nasheed’s transfer to house arrest this week and the vote for the constitutional amendment as a first step towards political reconciliation between Yameen’s government and the opposition. The ruling coalition is seeking to replace vice president Dr Mohamed Jameel Ahmed with 33-year-old tourism minister Ahmed Adeeb. Before yesterday’s vote, pro-government MPs had publicly accused Jameel of disloyalty and incompetence. 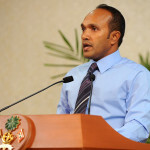 A Progressive Party of Maldives MP called on Jameel last night to resign or face impeachment. Opposition politicians and some media outlets have meanwhile claimed that President Abdulla Yameen is seeking a loyal deputy ahead of a life-threatening surgery. The government, however continues to deny rumors over the president’s health.